Heat the oil in a large frying pan and fry the chopped onion for 3 minutes. 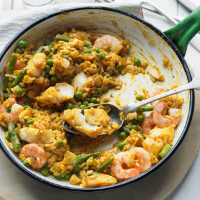 Add the haddock, the king prawns and curry paste and cook for a further 2-3 minutes. Stir in the risotto, cover and cook for 10 minutes, stirring occasionally. Serve with a fresh green salad.